Studio Aphorisma combines innovative designs and processes that push the boundaries of contemporary textile design. The studio collaborates with internationally renowned fashion and interior design companies and institutions such as the Bauhaus-Universität Weimar, for which the Studio recreated two Bauhaus textiles for the reconstructed Gropius Room. Strato is a collection of textile-based jewelery and accessories created on a computer-controlled loom. The designs explore the links among materials, new technologies, and traditional crafts. The resulting textiles reflect a deep knowledge of materials and craftmanship, while the process represents an innovation in contemporary design. Strato consists of two contrasting elements: a flat, rigid silver bracelet and a soft, flexible tube of woven silver threads. 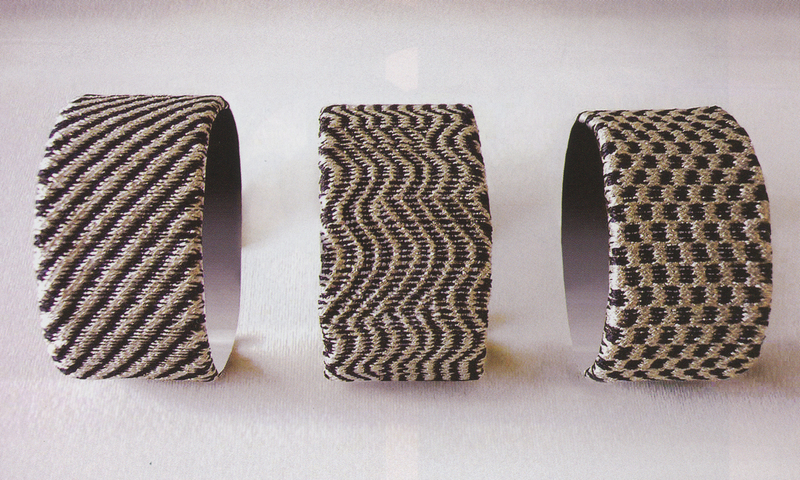 The tube is woven on a computer-controlled loom with light and dark silver threads, and the weave fully encapsulates the structural silver bracelet. Together, the two elements create a soft, flexible structure that makes the bracelet reconfigurable. The design sets rigidity in opposition with softness, stiffness with maleability, and two-dimensionality with three-dimensionality. The overall design balances the hard and soft elements – making the piece exciting in both a visual and a tactile way. The woven patterns reflect both flexible structure and changing surface. Through its maleable structure and response to lighting conditions, the piece constantly reconfigures itself. This flexibility allows Strato to transform with inexhaustible variation.